The Star Wars Rebels midseason finale, Rebel Assault, does not bode well for our heroes. We finally see the X-Wing fighter in action, but with decidedly poor results. Grand Admiral Thrawn (Lars Mikkelsen) proves once again that he is a formidable opponent. Kanan (Freddie Prinze Jr.) has another run in with the mysterious Loth-Wolves. This time, it seems he finally understands their cryptic message. Rebel Assault begins with Hera (Vanessa Marshall) leading a squadron of X-Wing and Y-Wing fighters. They drop out of hyperspace above Lothal. "Lock s-foils in attack position!" Hera, now referred to as "General", and the fighters engage Thrawn's armada at point blank range. Vult Skerris (Mario Vernazza) and his TIE Defender respond with a fleet of TIE fighters. It's an epic space battle as the fighters duke it out. Meanwhile on Lothal, the rest of Phoenix Squadron is putting detonators at the base of gun towers. These are the air defenses guarding the TIE Defender factory. Sabine (Tiya Sircar) destroys the towers as they escape on speeders. Governor Pryce (Mary Elizabeth McGlynn) radios Thrawn that their defenses are down. He tells her not to worry, the rebels will not breach his fighters. Hera and Vult Skerris are locked in aerial combat. Hera heads towards Thrawn's ship. Skerris follows her into the trap. Thrawn isn't fooled and opens fire on them both. Hera pulls up, then blows Skerris to pieces. She rejoins the surviving fighters and they head towards Lothal. Their victory is short-lived. Thrawn orders the "second wave" to attack. The rebel ships are destroyed by a huge number of TIE fighters waiting in the atmosphere. Phoenix Squadron watches in disbelief as the wreckage of falls to the ground. Kanan tries to contact Hera with no response. The rest of Phoenix Squadron is about to leave on speeders, but Kanan does not. He must find out what happened. He turns around and heads back. A soldier informs Thrawn that there are rebel survivors that have crash landed. Thrawn dispatches Rukh (Warwick Davis) to round them up. Hera has crashed in an alley. Chopper wakes her up, but she discovers his transmitter is damaged. They hide from the stormtroopers, then make their way to the edge of Lothal City. Suddenly she receives a rebel distress call. They follow the signal to find Mart (Zachary Gordon) and his R3 unit captured. Hera sneaks into a transport and drives over the stormtroopers. Chopper knocks out the last one. The R3 unit is destroyed, but Hera is able to transfer its transmitter to Chopper. All frequencies are being jammed. They attempt to escape, but are soon attacked by Rukh. They run through the alleys, but he leaps on top of them. Rukh disables Mart, as he turns to Hera, Chopper, who may be giving R2 a run as the best droid ever, stuns the Noghri. Meanwhile, Kanan is heading back to Lothal City at full speed. Suddenly a Loth-Wolf appears before him and he crashes. He gets up and is surrounded by three of them. The main one says "Dume", his real name. Kanan takes off his mask, "I understand." Hera and Mart locate a sewer entrance, but it's guarded by a walker and stormtroopers. Mart provides a diversion while Hera steals a speeder. She uses it to ram the walker's legs, bringing it down. Chopper opens the hatch, but they are intercepted by Rukh. He takes down Hera, who screams for Mart to run. He and Chopper escape down the hatch. Hera disables the hatch panel with her last shot. Pryce lands in a shuttle, sneers at Hera before knocking her out with a stun blast. Mart opens the hatch to find Kanan on the other side. He tells him that Hera has been captured by the Empire. Kanan says there's nothing he could have done, but he knows what to do now. They escape on his speeder as the Loth-Wolf watches. 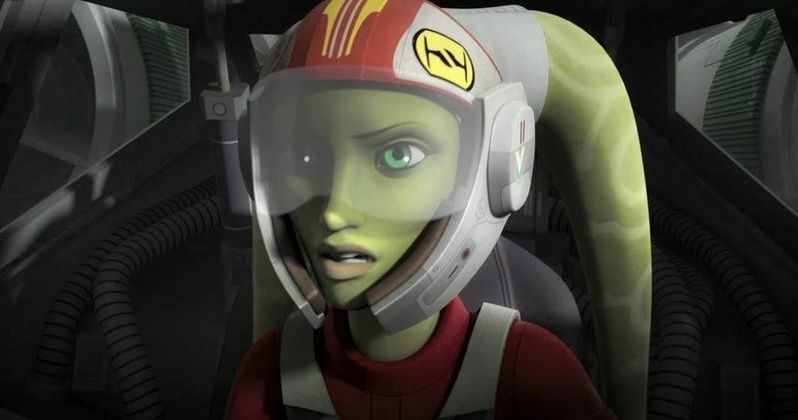 Star Wars Rebels hits the halfway point at full speed. The season has been absolutely thrilling so far. What's up with the Loth-Wolves? Why are the Jedi destined to return to Lothal? What fate does Thrawn have for Hera? We'll find out next year on Disney XD.